A woman’s body undergoes numerous hormonal and biomechanical changes during pregnancy. Chiropractic is a safe, noninvasive and very gentle way to help alleviate pain and ensure an overall better delivery. Many women choose to see a chiropractor for wellness and maintenance care during pregnancy. Dr. Heather uses a drop table with this hands-on manual adjustment that doesn’t require much force. Dr. Heather has had patients see her who didn’t even have complaints. They just heard from their midwife or OB or a friend that their chiropractor helped them so much to be comfortable through their pregnancy. Dr. Heather will check pregnant women on a wellness basis anywhere from once a week to once a month based on what they prefer, and what she prefers. “If someone comes in with a major complaint I will start off with several times a week before decreasing their care until their subjective and objective complaints improve,” says Dr. Heather. At around 34 to 36 weeks up until delivery, Dr. Heather will check a patient at least once a week. Then if they go into labor at any time during that period she can at least make sure their pelvis is adjusted. At the first visit, Dr. Heather will get a good case history from the patient. She will then perform a MyoVision nerve scan and a muscle scan. Dr. Heather will also do a full-spine adjustment on pregnant women on the first visit. She wants to make sure the nerve system is functioning better than when they walked in the front door. Dr. Heather uses a hands-on technique to check a patient’s neck, middle back, low back and pelvis. “I will also show pregnant women some important exercises to incorporate into their daily life through pregnancy,” she says. Dr. Heather is surprised to learn that some of her pregnant patients have found that other chiropractors didn’t want to adjust them. “I respect that but I think it’s one of the most important times for women to get adjusted,” she says. According to Dr. Heather, a lot of people don’t know that chiropractors can adjust infants. “If anyone has seen a child be delivered, or has watched their wife give birth, it makes a lot of sense where the first subluxation can come from.” When babies are born, whether it’s a very natural, no epidural childbirth or cesarean or forceps delivery or vacuum delivery, there’s a varying degree with each of those of the amount of trauma put on the child’s spine. When doctors have to pull or twist babies’ heads to get them to come out — maybe they’re stuck a little or maybe mom’s not pushing hard or efficiently — all of that is major stress on baby, especially their neck and cervical spine. 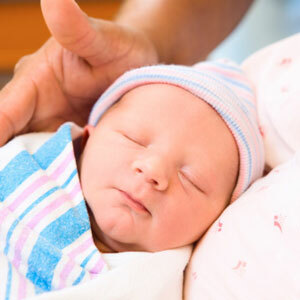 That’s why Dr. Heather always wants to check infants, especially in their neck, after birth. “Birth, in general, is a very traumatic process. Your uterus is using so much pressure pushing against this baby to join the world. It’s just very traumatic for mom and baby. So we like checking babies right away. When babies get adjusted they sleep better, they stop crying and they nurse better,” says Dr. Heather. Dr. Heather is different from other chiropractors as she’s confident; she has a gentler touch than most chiropractors, and she doesn’t use excess force — only the amount of force that’s needed. “My motto is ‘less is more.’” The fact that she’s a woman is also appealing to many pregnant women who want to be cared for by a female chiropractor. The practice is one of the few in the area that has a female chiropractor. Dr. Heather also has a large lending library for pregnant patients. The library features books on topics such as weaning, vaccinations and more. There are also lots of pictures in the office to enhance education. She considers Livin’ Well Family Chiropractic very much a learning environment for pregnant women. Come discover the benefits of pregnancy chiropractic care in Cheyenne. If you’re ready to get started, give us a call!